This is a great new venue for training events and courses, meetings and seminars. It is light and airy with lovely views of the farm. 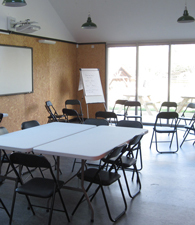 The room seats 40 adults, and has Wi-Fi and a digital project with an interactive whiteboard. You will also have access to the farm and be able to look at the animals, gardens and woodland and enjoy the relaxed atmosphere. "BAND has used the training room for First Aid and Child Protection training. It is a great space in a great setting. Staff where very helpful in helping us set up the room, we had tea, coffee and water available all day. We were able to have a circle of chairs and also tables set up for breakout groups. Participants were able to go outside during breaks and benefit from the lovely setting, great to be able to see trees and wildlife whilst still being in the city."